Today is a big day for fans of Alia Bhatt as her next big venture with none other than Sanjay Leela Bhansali was announced. 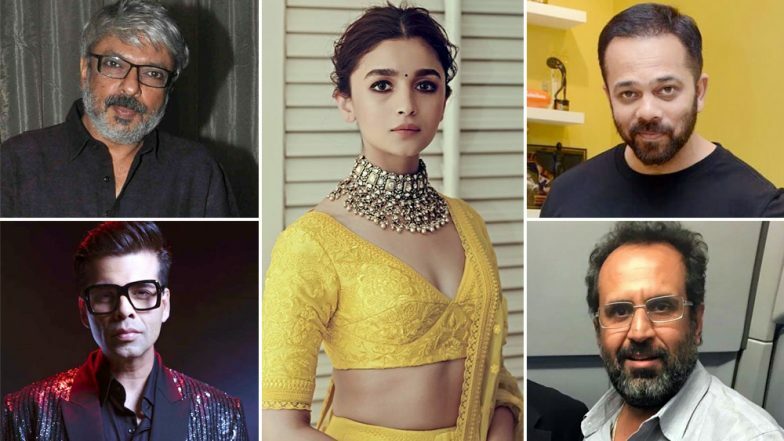 Alia has worked with some of the finest directors in the film industry and continues to work with the best of them with Bhansali being the latest. She has already worked with Karan Johar, Imtiaz Ali, Zoya Akhtar and Meghna Gulzaar and the audience has loved each and every character she has essayed in their movies. However, there are many more filmmakers that we wish to see her team up with. And who are they? Let's find that out! Confirmed! Alia Bhatt and Salman Khan To Come Together for Sanjay Leela Bhansali's Next Titled Inshallah. He is the box office king of Bollywood and Alia's filmy journey would definitely be incomplete if she won't ever collaborate with him! So Alia, here's our advice to you- Bag a role in the next Rohit Shetty film and you'd soon become the reigning box office queen of Bollywood! Not to forget it has been a while since we last saw Alia in a masala entertainer. Kabir Khan has given us movies like Bajrangi Bhaijaan and Ek Tha Tiger. We don't see a reason why Alia would ever say no to a film with the ace filmmaker. He is currently working on '83 starring Ranveer Singh. The film is based on World Cup '83 when Kapil Dev brought home the trophy and made the nation proud. It's a difficult time for Hirani since he has been recently accused of sexual harassment allegations. Leaving that aside, if he comes out clean and manages to make a movie, we'd definitely like him to consider Alia for his next. Sanju and 3 Idiots are some of his popular Bollywood films. Salman Khan in Inshallah, Shah Rukh Khan in Dear Zindagi – Alia Bhatt and Her Unusual Onscreen Pairings in Bollywood. Anand L Rai's last film - Zero didn't do very well at the box office but that doesn't make him any less of a talented filmmaker. Let's hope casts Alia has his leading lady in one of his upcoming projects. She is another powerhouse of talent and it would only add to Alia's 'CV' to have worked with Ashwini Iyer Tiwari. Inshallah, RRR, Brahmastra: Which Alia Bhatt Movie Are You Most Excited About? For now, Alia has her plate full with six mega projects coming up viz. Brahmastra with Ayan Mukerji, Takht and Kalank with Karan Johar's production house, Sadak 2 with Mahesh Bhatt, RRR with SS Rajamouli and of course, Inshallah with Sanjay Leela Bhansali. Clearly, she is the busiest actress in B-Town currently!